With Jake's new job as Produce Manager at the Berkshire Co-op Market we have been eating a lot less meat. Instead of bringing home thick pork chops, or a beautifully marbled London Broil every night, Jake is now carting home green and white striped zucchini and deep purple tomatoes. His working at the Co-op has also given us access to something else we've never really ate a lot of: fresh fish! The main reason we weren't eating a lot of fish is that we never felt sure we were getting the full story - was it fresh? sustainably caught? how far did it travel? do we even know enough to ask the right questions? It's hard to feel like there's full transparency around seafood - sometimes even at the green market. But now we have Austin Banach and Wes Mazlone! Around the time Jake was hired at the Co-op, so was our friend and fellow Monument High School grad, Austin. Austin is a fish and cheese monger who is just as passionate about his craft, and issues of sustainability and the local food economy, as we are. Lucky for us, he fills his case every week with bounty from Wes. Wes grew up in Scituate, Massachusetts, a prominent fishing community, and now lives in North Hampton, MA running BerkShore. Twice a week he drives to Scituate and picks up fish from the dock just caught by guys he grew up with. He then drives the fish back to the Berkshires and delivers it to the Co-op and other local restaurants and markets. On the days that Wes drops his fish off at the Co-op, we almost always take advantage. 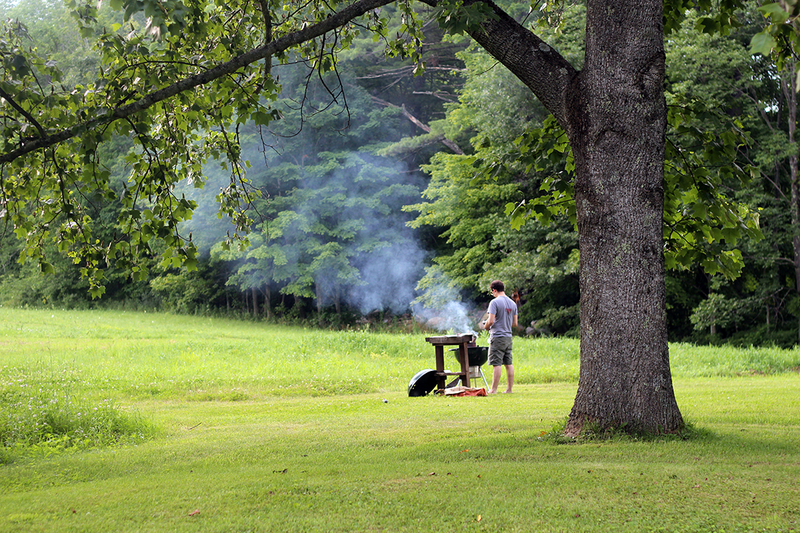 And now that it is full-on summer, we have become obsessed with grilling his beautiful product whole. 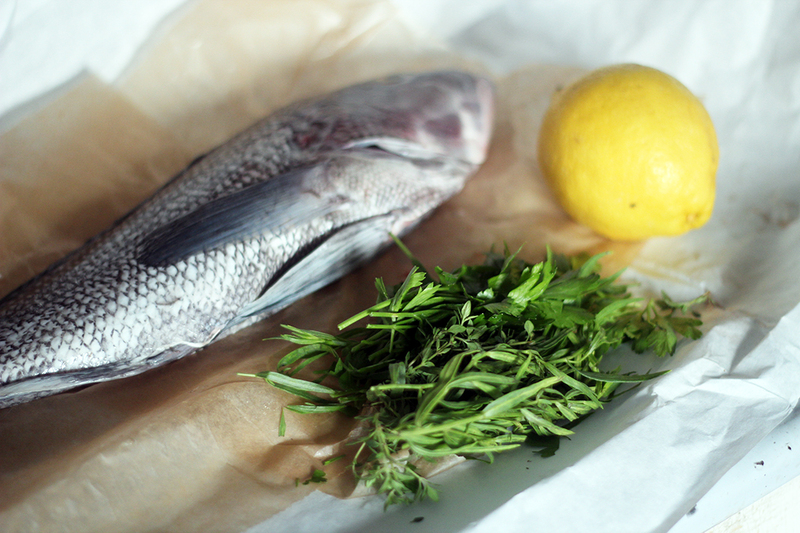 This week Austin had some gorgeous black sea bass in his case. We took the fish, a lemon, some local corn, a few heirloom tomatoes and zucchini, and headed home. 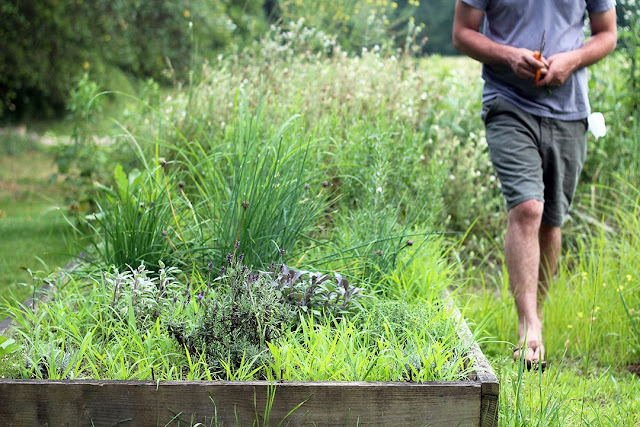 After getting the grill going we went out to the herb garden and got some tarragon and parsley out from under the serious weeds that have settled there. 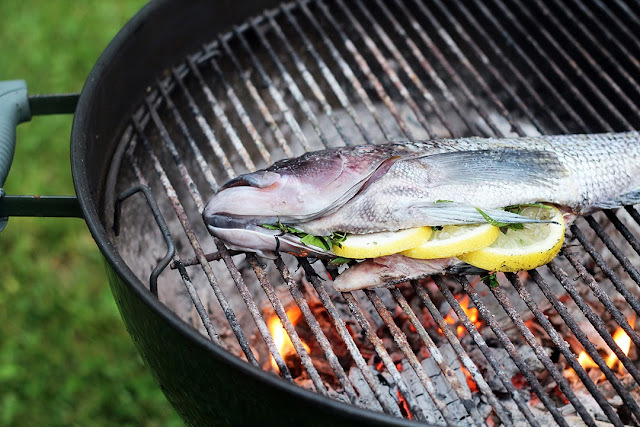 Next, easy as one, two, three, we stuffed the cavity of the fish with the herbs and lemon, sprinkled some salt on both sides of the fish, drizzled a little olive oil on top and tossed it on the grill. After four minutes on each side, we were sitting on the porch eatting a stunning, fresh, flavorful meal. + 1 whole fish (scaled and gutted). 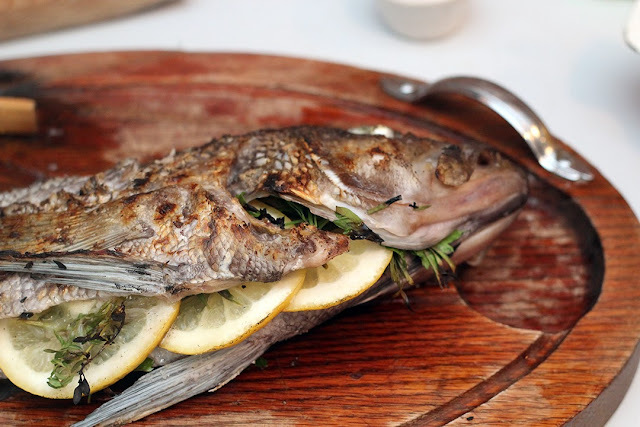 Right now we like Black Sea Bass and Porgy. 1. Stuff the cavity of the fish with the herbs and the lemon slices. 3. Put it on the grill and cook for 4 minutes, than flip and cook for another four minutes. 4. Take off the grill and let rest for a few minutes. Before serving squeeze some lemon on it.